These are by far the easiest bread recipe I’ve made with yeast. There is not a lot of kneading and rising time and it surprisingly still makes a rather airy breadstick. This recipe also gives me an excuse to use my Kitchen Aid mixer. Breadsticks within 45 minutes? I'm game! Mix water, yeast and sugar together in your mixer bowl. Let is stand for 5 minutes, then add the salt. Add a cup of flour at a time with your mixer on low speed. Ease the mixer up to medium speed while continuing to add flour. 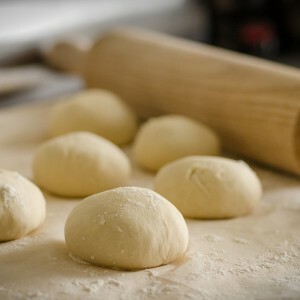 The dough should pull away from the sides of the bowl when the flour amount is perfect. I had to help mine by scraping flour into the dough mixture. When the flour is added, let the mix on medium high for 5 minutes. Turn the mixer off and let the dough rest for 5 minutes. Spread an 1/8 cup of melted butter in the bottom of a jelly roll pan (about 12 x 17). Put the dough in the pan and let it rest for a couple minutes. Then with floured fingers press the dough until it covers the pan. Mix the crushed garlic with the remaining 1/8 c of butter and spread it over the dough in the pan. Cover the butter mixture with shredded parmesan. Using a pizza cutter, cut the dough in half or thirds lengthwise and about 12 crosswise cuts. Put the pan in a 170 degree oven for a quick rise for 10 minutes. Leave the breadsticks in the oven and take the temp up to 350. Bake for about 12 -18 minutes until the desired level of golden brown. The pizza cutter or kitchen shears can finish the final cuts to separate each breadstick. This makes 24 to 36 short breadsticks. I find they freeze well too so I can pop a few breadsticks out to enjoy with soup or Italian night.